What it is: The meaningless debate about the iPad vs. a “real” computer continues. If you read this ZDNet article by Adrian-Kingsley Hughes, you can read a comparison between the iPad and the Surface Go where Adrian concludes that the iPad can’t compare to the Surface Go because of its operating system. Adrian says that if the iPad only ran macOS, it would be the perfect tablet, so the essential argument is simply that the operating system is all that matters. Now if you replace “iPad” with “PC” and replace “Surface Go” with “mainframe and minicomputers”, Adrian’s argument perfectly matches the early discussions of mainframe and minicomputer users that dismissed PCs as “toys” because they didn’t run a “real” operating system like UNIX. Back in the early 80’s when IBM introduced the IBM PC, mainframe and minicomputer users dismissed “PCs” as toys because they couldn’t run the same programs as mainframe and minicomputers. So therefore the PC was useless. Notice the similarity with today’s argument about the iPad vs. the PC? The iPad must be a toy because it can’t run the same programs as a PC. Yet as we saw with mainframe and minicomputers, the PC gradually grew in power while being more cost-effective and easier to access for individuals. Those advantages eventually killed mainframe and minicomputers. Notice those same features are gradually pushing the iPad into PC territory. The iPad processor is faster than most laptop processors and will only continue to improve. The iOS operating system is getting more powerful and more companies are porting their PC programs to the iPad such as Adobe Photoshop and AutoCAD, so pretty soon the iPad will run all important PC programs. The iPad is far easier to carry and use on the go than a laptop. Given all these advantages, it’s only a matter of time before the iPad takes over the laptop market. Remember, the iPad already killed the netbook so the laptop is going to be next. For many people, the iPad may not replace a laptop, but it can still be useful anyway just like a smartphone can’t replace a PC completely, but people still have smartphones and PCs. Any time you see someone arguing that the iPad isn’t a real computer, that’s the essence of fear. That means they’re afraid of being left behind because they refuse to change, so they’re hoping to delay the inevitable by convincing people that their antiquated views are right, even though history shows that it is not. If you don’t think an iPad can replace a laptop, then stick with a laptop and let other people use an iPad instead. Many people have found an iPad can replace what they used to need a laptop to do, and that’s fine. Many others have found that an iPad can’t replace a laptop and that’s fine as well. What’s not fine is when people use questionable arguments to convince you that their point of view is absolutely correct. If you don’t think the iPad can do many tasks that a PC can do, just look for your favorite mainframe and minicomputer enthusiast and ask them how well their mainframe and minicomputer is holding up against today’s PC and why the PC will never replace mainframe and minicomputers. Provided, of course, you can still find anyone still claiming mainframe and minicomputers are superior to PCs. What it is: Apple announced they plan to open offices around the United States. You may not want a job working for Apple, but you do want to know where Apple is opening offices so you can see where the greatest opportunities lie. Because wherever Apple goes, you can be sure other companies will be there too, and that will just translate into greater job opportunities for anyone who wants to get into the high-tech industry whether as an engineer, programmer, or even public relations, marketing, or sales person. If you look at the above graphic, you can see where Apple plans to open or expand offices. This is predominantly in the West Coast in cities such as Portland, San Francisco, and San Diego, but it also includes high-tech hubs such as Austin, Texas, Miami, Florida, and the East Coast around Boston and New York. That’s not to say there won’t be high-tech jobs elsewhere such as in Michigan, Minnesota, or Virginia. It’s just that the greatest number of opportunities will be near where Apple opens offices. If you have a high-tech job in Minnesota, you’ll simply have a harder time finding another job in that same area than if you lived in Austin or Boston. Comedian Woody Allen once said that most of success is simply showing up. So if you want a high-tech job, your best chances are to show up in the cities where Apple plans to open offices. That doesn’t mean you necessarily have to work for Apple, but where Apple goes, that’s where other companies will go as well. Job opportunities are everywhere, but may not be where you are. So your choices are simple. Either move to where the job opportunities are or make the best out of your area right now. Either way can work, but it depends on what you want to do. Generally, the best opportunities won’t come to you. You have to go to where they are. For many people, that means moving away but if the other option is to stay where you are and have no opportunities, that’s not really much of a choice at all. 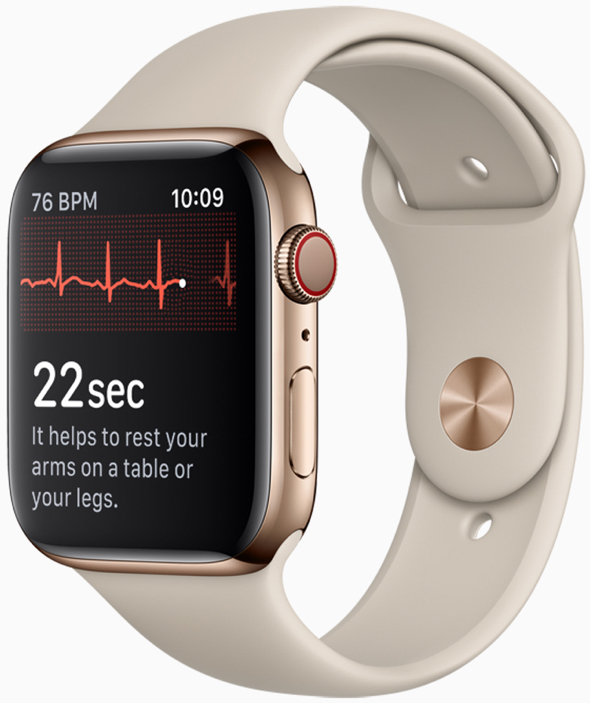 Ed Dentel recently got the latest Apple Watch and decided to play around with its electrocardiogram app. Strangely, the app warned him of atrial fibrillation. Since Ed exercises regularly and had no history of heart problems, he assumed the app was wrong and ignored its warning. Each time Ed tried the apple Watch, it warned him of atrial fibrillation until he finally started to get worried and went to see a doctor. That’s when he learned that his Apple Watch was right and by seeking medical attention, he might have just saved his life. No technology is useful unless it solves a problem. Cars solve the problem of transportation, telephones solve the problem of communication, and television solves the problem of viewing information over long distances. So when people first criticized the Apple Watch, they couldn’t figure out why they might want or need one. Over time, the purpose of the Apple Watch has been made strikingly clear. Wearable computers like the Apple Watch exist to solve the problem of real-time health monitoring. In the old days, the only way doctors could get medical information form a patient was for the patient to appear in the office and connect them to machines to measure their body functions. With wearable computers like the Apple Watch, individuals clan constantly monitor their health symptoms everyday far easier and more conveniently than going to a doctor’s office. The Apple Watch is for everyone interested in health and that includes everyone. If you aren’t interested in your own health, feel free to ignore the benefits of technology like wearable computers. For the rest of us, the Apple Watch will only get more sophisticated, accurate, and convenient. Pretty soon anyone not wearing a computer like an Apple Watch will be seen in the same light as people who still refuse to use a computer or a mobile phone. Now that the purpose of the Apple Watch is clear, Apple just needs to work on finding crucial uses for their other devices such as the Apple TV or HomePod. HomePod offers hands-free computing, but what is the crucial need for that? Apple TV offers the convenience of cutting the cord to cable subscriptions, but that’s not exactly a pressing need for many people when rival products do the exact same thing. The Apple Watch, iPhone, and iPad sell so well because they have a clear purpose. HomePod and Apple TV do not sell as well because their purpose is not as crystal clear. When Apple can figure out the purpose of hands-free computing (HomePod) or the Apple TV, then they’ll have another hit on their hands just like the Apple Watch.